As mentioned last week, I will be participating in an event in Fremont, California, on April 6, called “Appear for the Disappeared“, a five-kilometer walk to raise funds for Ensaaf, a non-profit organization that is documenting and seeking justice for the thousands of victims of state-sponsored disappearances during the 1980s and 1990s in Punjab, India. During that time, innocent men and women — particularly Sikhs — were the victims of torture and extra-judicial killings in Punjab by state agencies and police. To the lament of human rights organizations, the vast majority of perpetrators of these state crimes have enjoyed impunity and even promotion in the decades since, while the victims and their families have been neglected. I will be walking in memory of Jarnail “Jaila” Singh, a 23-year-old man from Amritsar, Punjab, who was arrested in 1990 and then killed shortly thereafter in a fake encounter by police — a common practice at the time. By sponsoring my walk, you will support Ensaaf in their mission to “end impunity and achieve justice for mass state crimes in India, with a focus on Punjab, by documenting abuses, bringing perpetrators to justice, and organizing survivors.” You can donate in memory of Jaila Singh here. Painting “Khoon ke Athru” by Harjit Kaur. This canvas painting, entitled “Khoon ke Athru” (“Tears of Blood”), is an expression of the history of the events of 1984 in India, and the disappearances of Sikhs that followed in the aftermath. This piece takes inspiration from the many images of Sikh women holding photos of lost family members during the Decade of Disappearances. Each element in my painting is symbolic, and the colors invoke those traditionally associated with the Khalsa. A woman – she may be a mother, wife, sister or daughter — holds two roses and cries tears of blood shaped to form “1984.” One of the roses she holds is still a bud, representing the disappeared and murdered youth. The other rose is in full bloom, representing the elders. The rose bud has two leaves together representing the two Sikhs – Satwant Singh and Beant Singh — who delivered justice after Operation Bluestar, and a third leaf further down represents Shaheed Jarnail Singh Bhindranwale. The fully bloomed rose has five leaves on it, representing the five rivers of Punjab that were divided during the lifetime of our elders. 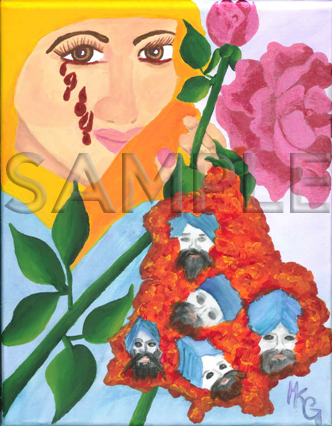 The woman cries over a burning and bloody Punjab that contains five Sikh men, representing those who have disappeared or have been lost, and also reminding us of the Guru’s Panj Pyaare, or Five Beloved Ones. My sincere thanks to Harjit Kaur for donating this painting. The artwork will be shipped to you free of cost once you have donated at my fundraising page. All funds collected will be donated to Ensaaf to support their dedicated work to preserve the memory of those who were lost and secure justice to the survivors of those tragic years. More information about the Appear for Disappearances 5K Walk is available here. UPDATE 3/20/2013: Thank you to Harmeet Singh Narula who donated $51 on March 19, 2013. You have been awarded the original artwork by Harjit Kaur. Please contact me here or send your mailing address to americanturban[at]gmail.com to make arrangements for delivery! Feel free to organize a walk and I will consider participating.